Einstein's principle of equivalence states that there is no physical difference between an accelerating frame of reference and one in a gravitational field. If the two frames are equivalent, then gravity can have special effects, such as bending light. The conventional analogy has the observer in a windowless box under the two different scenarios. In the first scenario the observer's box is fitted with a rocket engine on the bottom that would allow the box to be accelerated. The second scenario has the box simply sitting on the earth. The argument goes that no matter which of the two scenarios you are in, there is no experiment you can perform that would allow you to distinguish between the two different setups. In order for this to hold true, however, the box that the observer is in, must be infinitely small, i.e. a point in space. If the box is the size of, say, an elevator cab, there are a number of measurements that can be made to determine which of the two scenarios you are in. For example, if you hang 2 plumb bobs from the ceiling and measure the separation at the ceiling and then at the floor, strings in the rocket cab will be parallel while strings in the earth based cab will be closer together at the floor, the line of the strings converging at the center of the earth. Similarly, you could weigh an object with a spring-type scale at the floor and then near the ceiling and would find that in the rocket-based cab the weight would be the same at these two points, while in the earth-based cab, the object would weigh slightly more at the floor than it would near the ceiling as the object is slightly further from the center of the earth near the ceiling. In a slightly different set up* we employ circular corridors, as opposed to boxy cabs. Both circular corridors have curved 'floors' with radii of 10 meters. One corridor (the spaced-based one to the far left) is far from any gravitational effects but is spinning at a rate of 10 meters per second. 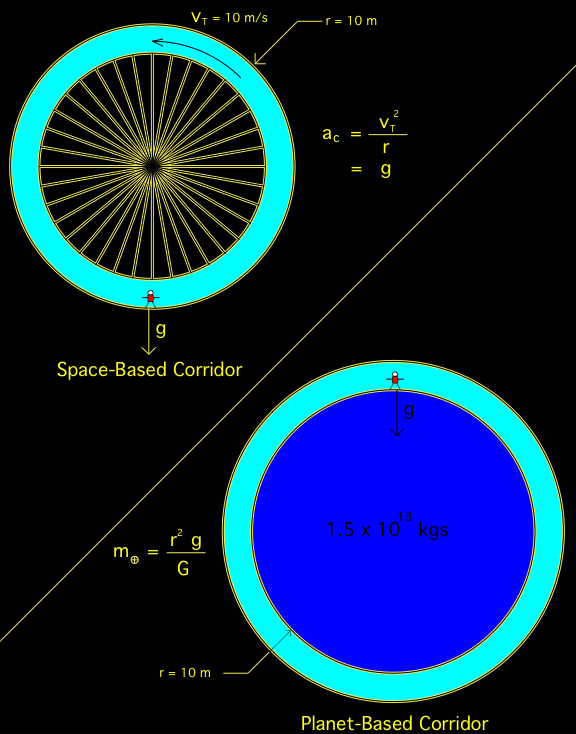 This would result in the observer (shown at the 'bottom' of the corridor) experiencing a force of g.
The other planet-based corridor wraps around a very dense but small (shown in blue) planet with a radius of 10 meters. If the planet had a mass of 15 billion metric tonnes, which, incidentally, would be the same density as a white dwarf star, it would exert a force of g on the observer (shown at the top). But how do these two different corridors compare? If you were to hang a pair of plumb bob's from the ceilings of both corridors, one set of plumb bobs would indicate that the strings are converging 10 meters above the floor while the other set would indicate the lines would converge 10 meters below the floor. In both cases, however, the measured weight of a mass would decrease as you moved from the floor towards the ceiling. More interesting, however, is that both observers would become weightless as they sprinted along the length of corridor. (assuming the space-based observer ran in a clockwise direction, i. e. in the opposite direction of the spinning space station). The planet based runner would be in orbit, while the space based observer would no longer be spinning. Each would be in a space that looped back on itself. One observer's floor would be curving downwards, while the other observer's floor would be curving upwards. * Could not find if this has been proposed previously but all examples found on the net use elevator cabs and rockets.